Cyber Threats, high social impact but … which is the level of awareness? Last week I had the opportunity to discuss with my father of adverse economic situation and in particular of the Italian public spending. I have introduced some reference to the arms and in particular cyber weapons. What are they? What are the threats we face? What is the social cost to fight and mitigate the threats? Without any surprise, I soon realized that he was not informed on the subject. I retried the experiment in the following days asking same questions to the common people, from workers to the engineers, through some politicians, and even into the latter category have not found the expected response. The level of awareness of the threat is very low and I believe this is due to the will of the governments intend to give information on the subject. The argument is thorny, uncomfortable, on which the debate is always “open” to an audience of specialists is often restricted. Unthinkable for common people that a computer virus can cause damage to the real world and that its development process can be very expensive. A millionaire investment to create a weapon capable of undermining the proper functioning of control systems of a nuclear power plant with obvious consequences on the population. When describing the threats people remain perplexed, amazed … is it possible that the shadow of a malware can cause death in the real world? Unfortunately yes. Recently the Pentagon has announced the development of a list of cyber-weapons and tools that include malware capable of sabotaging the critical systems of a possible hostile countries. The United States does not represent an exception, the tendency to strong investment in the sector is widespread. The integration of cyber-technologies into government arsenals is perhaps the most significant operational development in military cyber doctrine in years. I find these sentences full of meaning that make the idea of the perceived level of critical facilities and government Agencies. To give a dimension to investment made is absolutely impossible because of the paucity of information available about the topics, for sure we are dealing with figures that represent a substantial portion of the major expenditure budget of a Nation. If we are dealing with a government commitment so strong and threats that can definitely affect the security of a Nation like a pandemic flu, why do not provide transparency on the subject? Why should taxpayers not be sensitized on the issues? In 2009, official sources claimed a voice in the Cyber ​​Defense spending in just six months of about $ 100 Million . We are facing is the tip of the iceberg, do not need much imagination to understand the dimensions of the expenses incurred in the last two years. So far we dealt with those who are the direct costs incurred by Nations to meet the threats of cyber attacks, ignoring the impact of these have on the social fabric and in particular about the companies. The productive apparatus of a nation is composed of a multitude of companies who suffer the threats significantly. Consequence is the increase in expenditure that they incur in order to deal with obvious adverse impact on their finances. 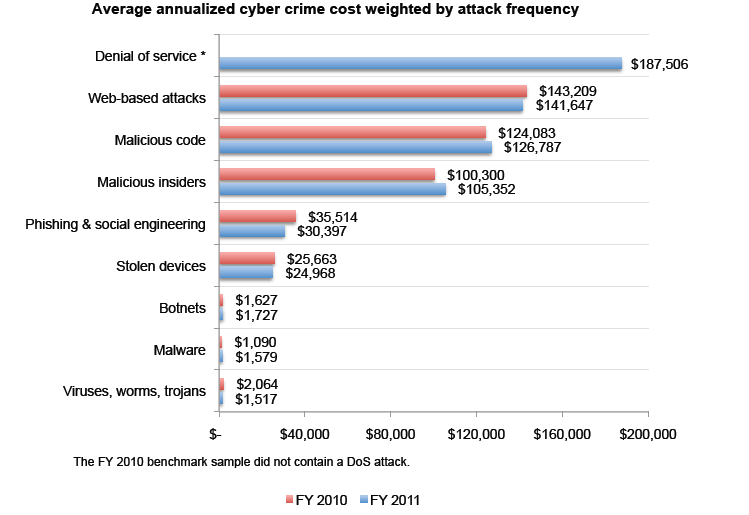 Let’s give a look on interesting benchmark Study of U.S. Companies, the Second Annual Cost of Cyber Crime Study. We are dealing with a vicious mechanism for which the economic difficulty that arises on the approach to cyber threats, has led to a more or less overt instability of supply and its cost of production. Loss of jobs, loss of competitiveness of our companies, inability to protect the know-how of the company, they represent a cost that the taxpayer always pays ignoring it! Of course my post is intended as a starting point for a series of reflections on the impact of cyber threat in daily life with particular reference to the economic impact that is perceived by the citizen. Let us consider an open discussion of which this article will be the introduction and whose continuation is in your hands. Massive DNS poisoning: What happened to brazilian ISPs? This Blog was most helpful, your ideas are straight to the point, and the colors are cool too. Thank you! It is just the beginning. Please do not hesitate to contact me to suggest topics and give your opinion on my blog. Simply desire to say your article is as astonishing. The clearness in your post is just spectacular and that i could think you’re a professional in this subject. Fine together with your permission allow me to seize your feed to stay updated with imminent post. Thank you a million and please carry on the gratifying work.